The celebrated John Burningham opens the door to a child’s secret adventure in this new picture-book classic. What if you noticed a door in your bedroom that wasn’t there before? And what if it led to a passage to . . . the zoo? You might want to take just one little bear back to your room with you, or maybe just all the smaller animals. But how could you resist the penguins and the tigers and the birds? In this classic child’s fantasy featuring John Burningham’s delightfully expressive artwork, an unlocked door leads to pandemonium — and one little girl’s formidable voice reins in an entire menagerie. 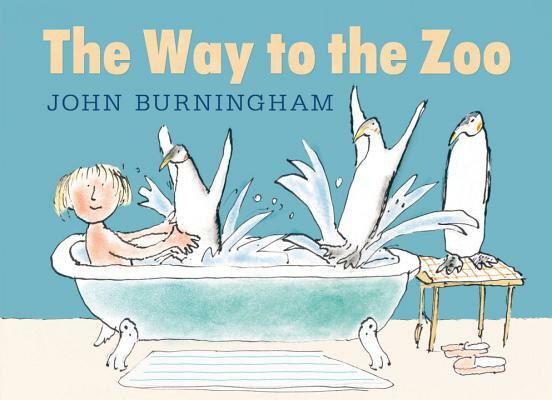 John Burningham (1936-2019) was one of the world’s most recognized and beloved illustrators. His work has received countless awards, including a Boston Globe–Horn Book honor for It’s a Secret! and two Kate Greenaway Medals. Over his fifty-year career, John Burningham wrote and illustrated more than thirty picture books, including Picnic, Motor Miles, and Mouse House. He and his wife, Helen Oxenbury, had three children. With characteristic simplicity and economy of line, veteran illustrator Burningham conveys the wonder of Sylvie’s discovery, thus fulfilling a common childhood fantasy—to bring real, live zoo animals into your room and have them sleep in your bed. ... As in so many of his other books, Burningham’s appeal lies in his ability to invent a fantasy scenario available only to young children, accomplishing it again here with consummate grace. The sketchy pen, pencil, pastel and watercolor illustrations are set against expansive white space that frames the action from page to page. Text and art work seamlessly together in this perfect tale that mirrors the secret dreams of many imaginative children. With the true Burningham touch, Sylvie’s arrangements have both the impeccable childlike logic and the solid reality of the best fantasy. His loose, masterfully limned drawings are touched with scrumptious, harmonious hues—pure blue with elegant chartreuse, a black-raspberry chair with turquoise legs, various animals in benignly soft browns and grays. Pen-and-ink drawings feature lines that fairly quiver, capturing the excitement and action. ... An imaginative romp.